Everyone wants a playground that is truly one-of-a-kind; one that stands out from all the others. You want children to enjoy a unique and memorable experience they can’t find anywhere else. But let’s face it: It’s getting harder to create a “unique and memorable experience” in today’s world of short attention spans and competition from computer-generated special effects on small and large screens. Children crave physical and mental stimulation. That’s why the creative designs you find in “themed” playgrounds can capture their imagination and encourage them and their families to keep coming back for years to come. Themed playgrounds inspire creativity, which in turn builds confidence. For example, a playground with a military theme lets kids play soldier and go on “missions” with their friends. If you live in a community with a military connection, this helps them feel connected to the “grown-up” world around them. Themed playgrounds can even inspire cognitive development in ways other playgrounds don’t. A police or fire department theme encourages role playing; it also helps kids imagine helping others, racing to an emergency, and collaborating with the rest of a team to get the job done. 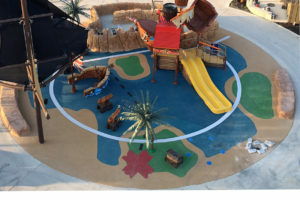 No Fault partnered with All Inclusive Rec to create a “farm theme” for Adventureland Resort in Altoona, Iowa. 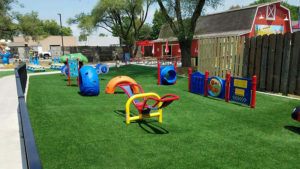 We provided our No Fault PlaySafe 50 Synthetic Turf System to build out the playground areas. How did Adventureland’s administration decide on the “farm” theme? Molly says the farm theme, which includes a giant tractor and sky-high sunflower installations, has been a huge hit with the kids. It gives them something fun to do while waiting for the roller coasters and other rides elsewhere in the park. If you own a business, school, or church, you can use custom playgrounds to match your brand or your message. 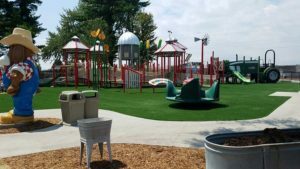 Aside from our synthetic turf, No Fault Safety Surface is perfect for themed playgrounds since it can include built-in designs and school colors. 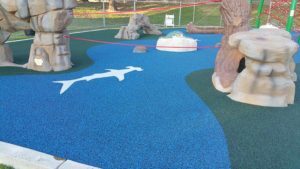 Woodfield Park in Lathrop, California used No Fault Safety Surfacing to create an underwater sea adventure with bright colors combined with large shark decals to suggest movement and fluidity throughout the park. With custom playground designs, the opportunities are endless! 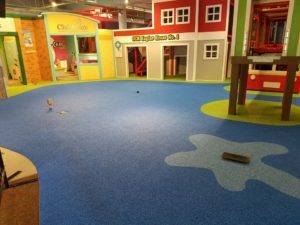 Some themed playgrounds are visually stunning, drawing kids in with colors and shapes they usually only see on TV, in computer games, and in movies. Stockholm’s “Fruit and Scent Park” (Fruktlekparken), for example, is a place where kids can slide down banana peels, spin around on strawberries, and swing on cherries. 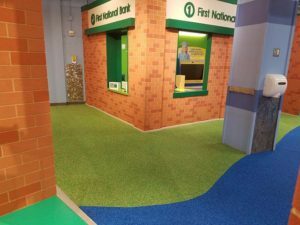 There’s also the Dinosaur Island play area in West Sussex’s Southwater Country Park, sparking imaginations and inspiring kids to learn more about their favorite Jurassic-era creatures. 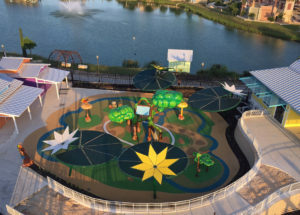 Of course, these are “go big” designs from world-class parks and playgrounds. Don’t feel the need to “go big or go home” with your playground design. Even a single feature is enough to inspire children. You never have to take an “all or nothing” approach! You can add imaginative, educational art to existing panels or playground equipment. Even a mural depicting well-known scenes from fictional stories or scientific facts about the natural world can inspire parents and children to engage in learning and imaginative play. 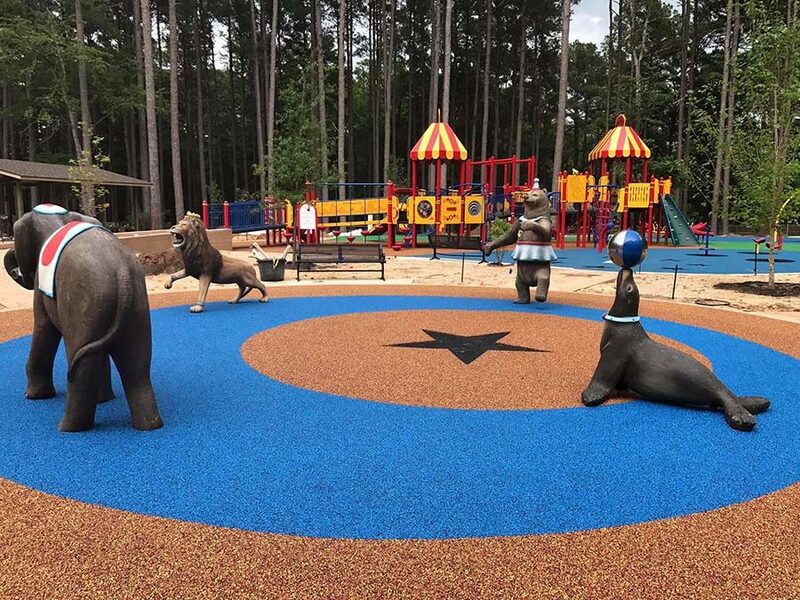 When building out your themed play space, you’ll work with engineers and fabricators to create custom sculptures and other features to give your playground just the right touch. Indeed, a good design team can create a custom concept for a theme playground to fit any footprint and budget. Your imagination is the only limiting factor. 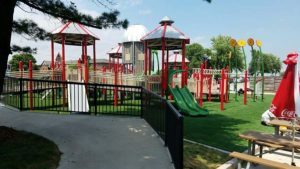 Finally, whatever designs your imagination (and budget) allow, make sure you build an inclusive playground where the equipment can be used by children of all ages and abilities! Make sure your equipment uses quality materials and that it meets or exceeds all industry safety standards. 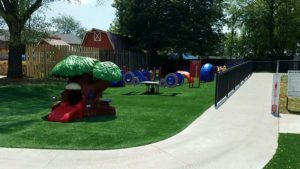 Poured-in-place rubber and synthetic turf are popular safety surfacing options in modern playgrounds. 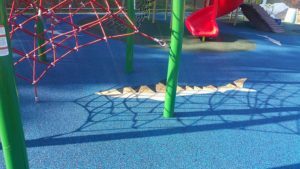 Safety standards regarding playground surfacing can be found in ASTM F1292. For manufactured playground equipment, the International Play Equipment Manufacturers Association (IPEMA) offers third-party certification. What theme are you considering? Contact us today, and we’ll help make your vision a reality! 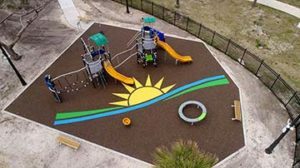 No Fault is a leader in the sports and recreational industry, developing remarkable playground safety surfacing with a strong commitment to playground safety and durability. No Fault understands what weather, sun, and thousands of happy kids can do to a playground. 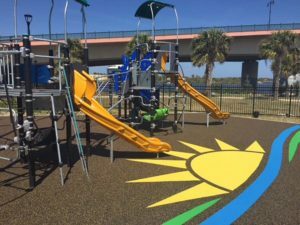 Our custom products bring color and protection to themed playgrounds and parks nationwide.